Full details of the other studios will be here in due course. 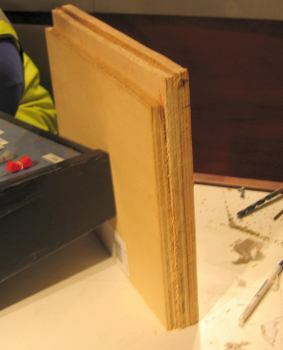 The 2004 Tilbury RSL came from what was the original Dutch studio, using the oriiginal Dutch mixing desk. 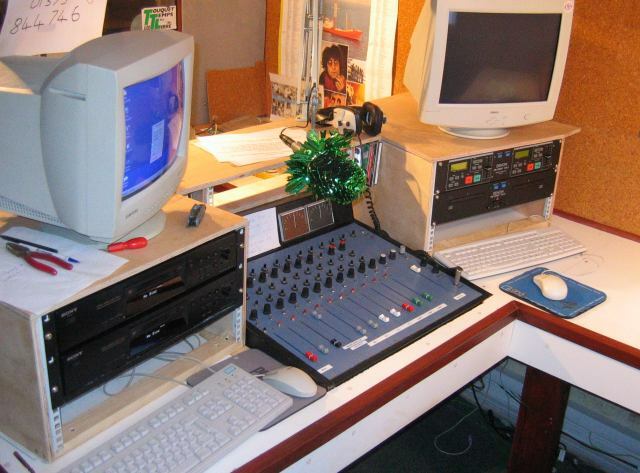 Although computer and CD playout equipment was added to the studio for the RSL, it was felt that space and layout in the studio was not optimal for the new equipment. Also, with the large number of visitors and guests coming to the ship, it was not very visitor friendly with only the back of the jock's head being visible from outside. Hence, it was decided to rotate the woodwork through 90 degrees, creating an area where guests and interveiwees could sit, and making it easier for visitors to talk to the on-air jock. 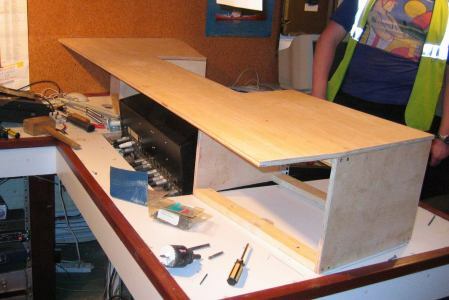 The new layout of woodwork would be designed for the new computer systems and not turntables and cart-machines, thus giving much more efficient use of the available space. At the same time, all the wiring, both audio and mains has been re-wired, with significant upgrades to the mains distribution within both studios to suit modern day equipment. The new studio had its second airing in the new layout over the first weekend of December where the CD and MD players simply sat on the worktop. 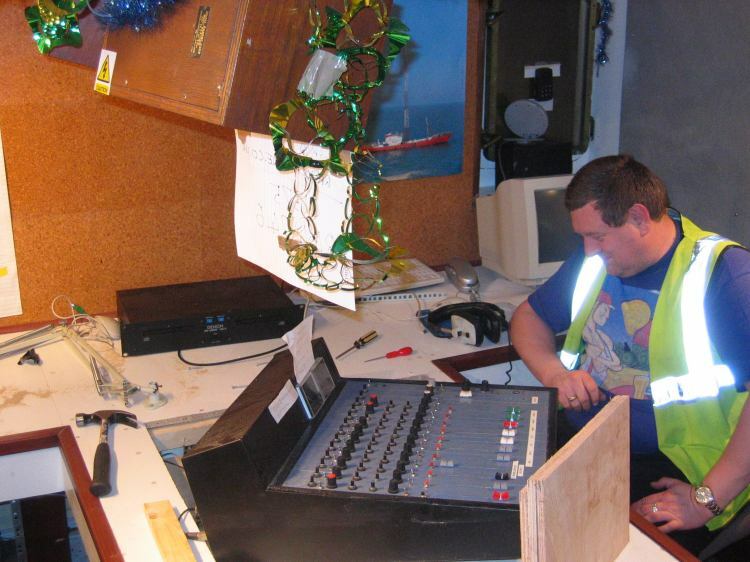 These are a couple of views of the temporary arrangement of the studio as it was in early December. The Sony MD players are on the jocks left, on top of which is the e-mail computer. To the jock's right are the Denon CD players, ontop of which is the monitor for the DPS playout computer system. 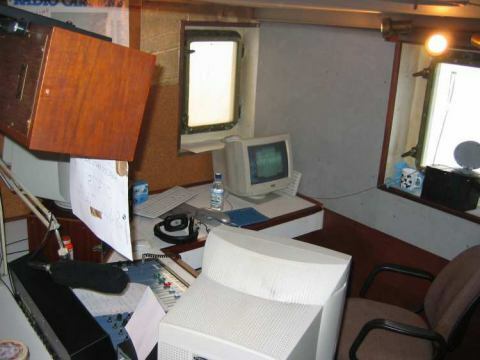 In the far corner, under the porthole is the streaming computer which sends the signal to Maidstone. This computer is "out of the way" to stop anyone accidentally making alterations to it. 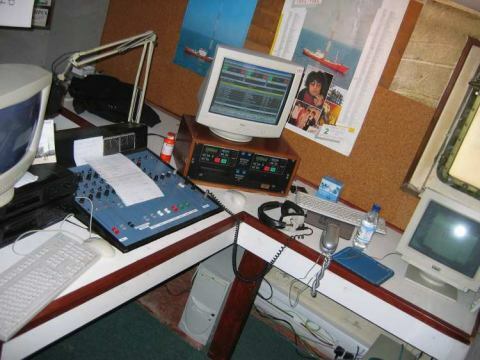 During the very first weekend the new studio went on air in early November, this computer was also used for e-mail, hence various on-air comments about not being able to read the e-mails without twisting your neck. A Sanyo Worldspace dish can be seen looking out of the porthole. 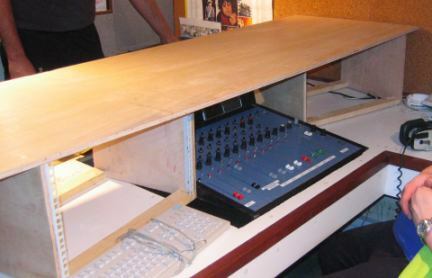 Although the studio is built around the original Dutch desk, this was extensively overhauled by Rob Ashard prior to the RSL, and some further upgrades are planned prior to a possible RSL in 2005. 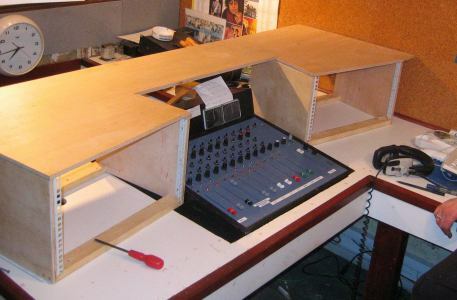 During the run up to the New Year period work started on building a wooden bridge over the top of the mixing desk. 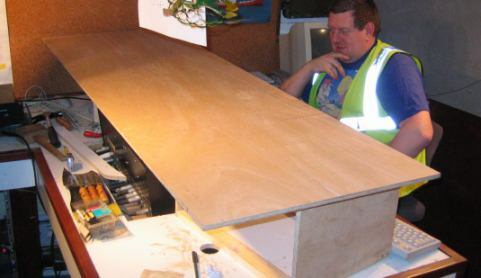 This is intended to provide more work surface as well as provide stable fixings for the CD and MD machines, etc. Initially we were planning to simply measure up and locate the equipment, and maybe make a start to cutting. However, little did we know when we started that is was to become one of those "do or die" projects which entailed two subsequent nights of sawing and drilling till 3 in the morning. Here we see Dave Foster's foot finding a new use for a beer crate as Lee sets to work. 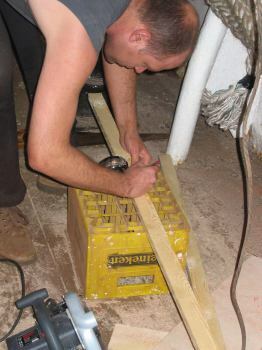 However, despite their best efforts, attempts to cut four identical pieces of wood end in disaster. 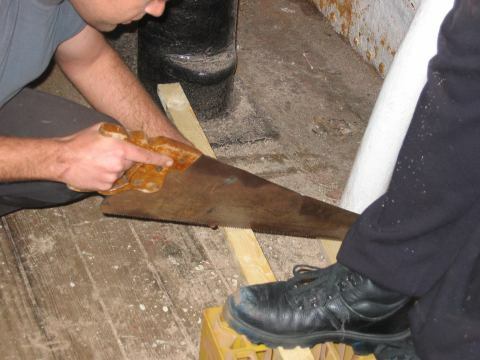 Apparently the blade in the power saw was offset from the cutting line by a significant distance which resulted in four bits of wood all of different and incorrect sizes. Yeah, right. Like I believe that. With the top surface measured up and everything where we want it to be, Lee can make a start to cutting the top. Measure twice, cut once, as they say. And mind your head on those speakers, Lee. Finally, it all starts to come together (as the actress said to the bishop) and the assembly of random pieces of wood almost resembles a radio studio. And finally, with all the equipment in place we have a studio! Due to the proximity of the monitor loudspeakers above the desk, as we manouvered the woodwork there were many close encounters between our heads and the speakers, followed by various curse words, which quickly gave rise to the phrase "mind your head on those speakers". Somewhere in the process of the "up your end a bit" and "it needs to be a bit longer" moments of the job, the phrase "as the actress said to the Bishop" came into the early morning conversation. 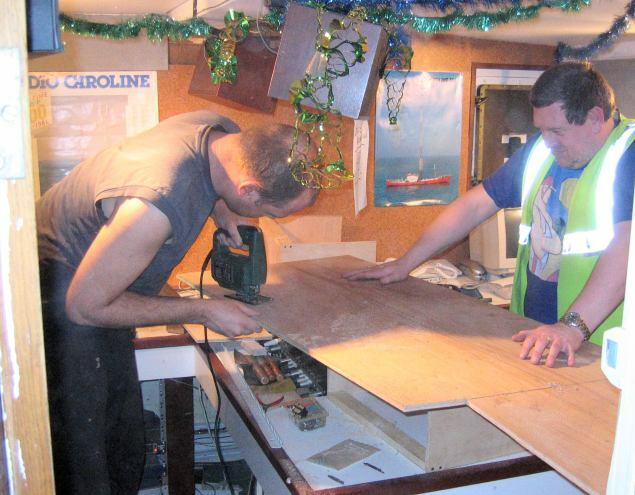 During the following days it became the duty of Foster, Lee and Alan to drop both lines into into as many conversations as possible, much to the consternation of the crew members who arrived for the New Year party unaware of how much hard work and friviolity had gone into the previous two days. Needless to say, both phrases made it onto the airwaves many times during the New Year weekend broadcasts, probably much to the confusion of the listeners. During January and February much cosmetic work in and around the studio was completed, the woodwork was varnished, the mixing desk was taken away for an overhaul and some modification, and some general loose ends were tidied up. Only one problem has manifested which still needs attention, namely that the microphone has a tendency to pick up 75Hz field scan buzz from the e-mail computer monitor. We've tried several monitors, but they are all just as bad. If anyone has a spare flat-screen display they would like to donate, please feel free to get in touch!